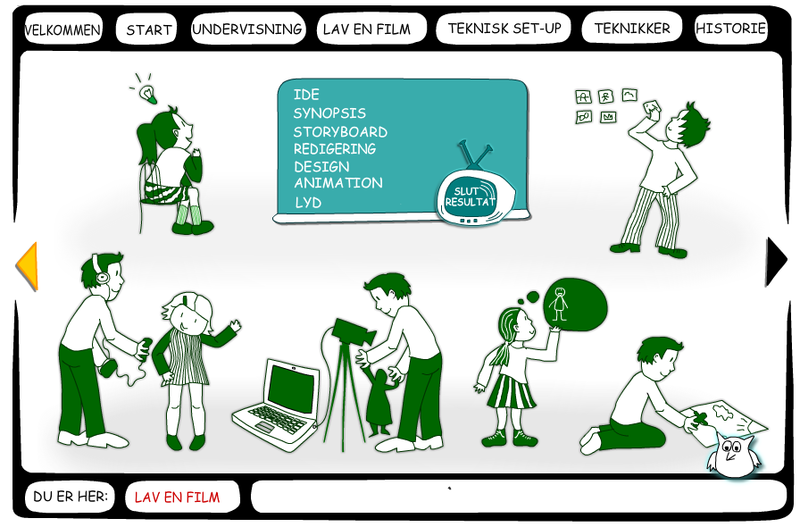 Er det første gang I skal prøve kræfter med at lave animationsfilm i undervisningen eller har I brug for hjælp til at organisere et animations-forløb kan jeg varmt anbefale websiden Animwork. Her finder man en dansk guide til fremstilling af animationsfilm. Guiden dækker hele arbejdsprocessen fra idéfasen til det færdige produkt med trin-for-trin-vejledninger og en masse gode råd omkring planlægning, teknisk udstyr, animationsteknikker, redigering m.m. Herudover indeholder guiden også en indføring i animationsgenrens historie. I do enjoy the way you have presented this matter and it really does offer me personally some fodder for consideration. However, through everything that I have personally seen, I only trust when other comments pack on that individuals remain on issue and in no way get started upon a soap box regarding the news of the day. Still, thank you for this excellent point and whilst I can not really agree with this in totality, I respect the standpoint. Normally I don’t read article on blogs, but I would like to say that this write-up very pressured me to take a look at and do so! Your writing style has been amazed me. Thank you, very nice post. Some genuinely nice and utilitarian info on this internet site, besides I conceive the pattern has got fantastic features. I really enjoy looking at on this internet site, it holds excellent posts. “Do what you fear, and the death of fear is certain.” by Anthony Robbins. naturally like your web-site however you need to take a look at the spelling on several of your posts. A number of them are rife with spelling problems and I find it very bothersome to inform the truth then again I will certainly come back again. hello there and thank you for your info – I have definitely picked up something new from right here. I did however expertise some technical issues using this site, since I experienced to reload the site a lot of times previous to I could get it to load properly. I had been wondering if your web host is OK? Not that I’m complaining, but sluggish loading instances times will often affect your placement in google and could damage your high quality score if advertising and marketing with Adwords. Anyway I’m adding this RSS to my email and can look out for much more of your respective fascinating content. Ensure that you update this again very soon..
Hello, Neat post. There’s a problem together with your site in web explorer, may test this… IE nonetheless is the marketplace chief and a good part of other folks will pass over your excellent writing because of this problem. naturally like your web-site but you have to check the spelling on quite a few of your posts. A number of them are rife with spelling issues and I find it very troublesome to tell the truth nevertheless I’ll definitely come back again. My brother suggested I would possibly like this website. He was totally right. This publish actually made my day. You can not believe simply how much time I had spent for this information! Thank you! Hey there! This is my 1st comment here so I just wanted to give a quick shout out and say I genuinely enjoy reading your posts. Can you suggest any other blogs/websites/forums that cover the same topics? Thanks a lot! Hello! This post could not be written any better! Reading through this post reminds me of my old room mate! He always kept chatting about this. I will forward this page to him. Fairly certain he will have a good read. Many thanks for sharing! I’ll immediately seize your rss feed as I can’t in finding your email subscription hyperlink or e-newsletter service. Do you have any? Kindly permit me realize in order that I may just subscribe. Thanks. Nice post. I be taught something tougher on completely different blogs everyday. It’ll always be stimulating to learn content material from different writers and observe a little one thing from their store. I’d choose to use some with the content material on my weblog whether you don’t mind. Natually I’ll provide you with a link on your web blog. Thanks for sharing. Im no longer sure the place you are getting your info, however great topic. I must spend some time finding out much more or understanding more. Thank you for magnificent info I used to be searching for this information for my mission. naturally like your web-site but you need to check the spelling on quite a few of your posts. Several of them are rife with spelling issues and I to find it very bothersome to tell the truth however I¦ll certainly come again again. Hiya! I simply wish to give an enormous thumbs up for the good information you’ve gotten right here on this post. I will likely be coming back to your blog for more soon. I’m still learning from you, as I’m making my way to the top as well. I certainly liked reading all that is posted on your website.Keep the aarticles coming. I enjoyed it! Somebody essentially lend a hand to make significantly articles I’d state. This is the first time I frequented your website page and thus far? I amazed with the research you made to create this particular submit incredible. Great job! Nice post. I be taught one thing tougher on different blogs everyday. It can all the time be stimulating to learn content from other writers and apply slightly something from their store. I’d want to use some with the content material on my blog whether you don’t mind. Natually I’ll offer you a hyperlink on your web blog. Thanks for sharing. Real informative and great structure of subject material, now that’s user friendly (:. I have read several good stuff here. Certainly worth bookmarking for revisiting. I surprise how a lot effort you set to create the sort of great informative site. Wow, incredible weblog structure! How lengthy have you ever been running a blog for? you made blogging look easy. The overall glance of your website is great, let alone the content! Hiya, I am really glad I’ve found this information. Nowadays bloggers publish just about gossips and internet and this is really annoying. A good web site with interesting content, this is what I need. Thank you for keeping this website, I will be visiting it. Do you do newsletters? Can not find it. It¦s really a great and helpful piece of info. I am happy that you simply shared this useful information with us. Please stay us informed like this. Thanks for sharing. Hey very cool website!! Guy .. Excellent .. Superb .. I will bookmark your website and take the feeds additionally…I’m happy to search out so many useful info right here within the post, we’d like work out extra strategies in this regard, thank you for sharing. . . . . . But wanna remark that you have a very nice site, I like the design it actually stands out. I conceive this site has some real fantastic information for everyone. “As we grow oldthe beauty steals inward.” by Ralph Waldo Emerson. Hi my friend! I wish to say that this article is amazing, great written and include almost all significant infos. I¦d like to see extra posts like this . Wow, amazing blog layout! How long have you been blogging for? you make blogging look easy. The overall look of your web site is great, as smartly as the content! After examine a number of of the weblog posts in your web site now, and I actually like your method of blogging. I bookmarked it to my bookmark web site list and might be checking back soon. Pls try my web site as properly and let me know what you think. I conceive this web site has got some rattling excellent information for everyone. “It is easy enough to define what the Commonwealth is not. Indeed this is quite a popular pastime.” by Elizabeth II. A powerful share, I just given this onto a colleague who was doing slightly evaluation on this. And he the truth is purchased me breakfast as a result of I found it for him.. smile. So let me reword that: Thnx for the deal with! But yeah Thnkx for spending the time to discuss this, I really feel strongly about it and love reading more on this topic. If doable, as you change into experience, would you mind updating your blog with extra particulars? It is highly helpful for me. Massive thumb up for this blog put up! Keep up the fantastic piece of work, I read few blog posts on this internet site and I conceive that your web blog is really interesting and has got bands of good information. I will right away take hold of your rss as I can not find your e-mail subscription hyperlink or e-newsletter service. Do you have any? Please allow me understand so that I may subscribe. Thanks. Great goods from you, man. I’ve understand your stuff previous to and you’re just too great. I actually like what you have acquired here, certainly like what you’re stating and the way in which you say it. You make it enjoyable and you still take care of to keep it smart. I cant wait to read much more from you. This is actually a tremendous web site. The root of your writing while appearing reasonable initially, did not really settle well with me after some time. Somewhere throughout the sentences you actually managed to make me a believer but only for a short while. I nevertheless have a problem with your leaps in assumptions and one would do well to fill in those breaks. When you actually can accomplish that, I could surely end up being fascinated. I used to be recommended this website by way of my cousin. I’m no longer sure whether or not this post is written via him as no one else recognize such detailed approximately my problem. You’re amazing! Thank you! I really enjoy reading on this website , it has got superb blog posts. “I have a new philosophy. I’m only going to dread one day at a time.” by Charles M. Schulz. I love what you guys are usually up too. This kind of clever work and coverage! Keep up the great works guys I’ve added you guys to my own blogroll. I really thankful to find this website on bing, just what I was looking for : D too saved to my bookmarks. Thanks for your personal marvelous posting! I definitely enjoyed reading it, you might be a great author.I will remember to bookmark your blog and definitely will come back very soon. I want to encourage continue your great job, have a nice weekend! Hey there! I’ve been following your site for some time now and finally got the courage to go ahead and give you a shout out from Porter Tx! Just wanted to say keep up the great work! Good post. I be taught something tougher on totally different blogs everyday. It’ll at all times be stimulating to learn content from other writers and follow a little something from their store. I’d desire to use some with the content on my weblog whether you don’t mind. Natually I’ll provide you with a link in your web blog. Thanks for sharing. Wonderful items from you, man. I have have in mind your stuff previous to and you’re just too magnificent. I really like what you have got here, certainly like what you are saying and the best way through which you assert it. You make it entertaining and you continue to care for to keep it smart. I can not wait to read far more from you. That is actually a great web site. Simply wish to say your article is as amazing. The clarity in your post is just excellent and i could assume you are an expert on this subject. Fine with your permission allow me to grab your feed to keep updated with forthcoming post. Thanks a million and please keep up the rewarding work. I simply could not go away your website before suggesting that I really enjoyed the standard information an individual provide to your guests? Is going to be back incessantly to investigate cross-check new posts. Whats Happening i’m new to this, I stumbled upon this I have found It absolutely useful and it has helped me out loads. I hope to contribute & aid different users like its aided me. Good job. Some genuinely fantastic content on this website, thank you for contribution. “We are always in search of the redeeming formula, the crystallizing thought.” by Etty Hillesum. Good – I should certainly pronounce, impressed with your website. I had no trouble navigating through all tabs as well as related information ended up being truly easy to do to access. I recently found what I hoped for before you know it in the least. Reasonably unusual. Is likely to appreciate it for those who add forums or something, web site theme . a tones way for your customer to communicate. Nice task. I must voice my affection for your generosity supporting persons who absolutely need assistance with this important matter. Your very own dedication to getting the message along has been incredibly insightful and has regularly permitted women like me to realize their targets. Your new interesting tips and hints implies a lot to me and far more to my office workers. Regards; from everyone of us. I?¦ve been exploring for a little bit for any high-quality articles or blog posts on this kind of area . Exploring in Yahoo I at last stumbled upon this website. Reading this info So i?¦m glad to express that I have an incredibly just right uncanny feeling I came upon exactly what I needed. I so much no doubt will make sure to don?¦t disregard this web site and give it a glance on a continuing basis. I have been exploring for a bit for any high-quality articles or blog posts on this sort of house . Exploring in Yahoo I eventually stumbled upon this website. Reading this info So i¦m happy to express that I’ve an incredibly good uncanny feeling I discovered exactly what I needed. I most without a doubt will make sure to do not disregard this site and provides it a glance regularly. Great V I should definitely pronounce, impressed with your web site. I had no trouble navigating through all the tabs and related info ended up being truly simple to do to access. I recently found what I hoped for before you know it at all. Reasonably unusual. Is likely to appreciate it for those who add forums or anything, web site theme . a tones way for your client to communicate. Excellent task..
Hey there! Someone in my Facebook group shared this site with us so I came to look it over. I’m definitely enjoying the information. I’m bookmarking and will be tweeting this to my followers! Superb blog and terrific design. I was looking through some of your blog posts on this site and I believe this website is very instructive! Retain putting up. I’ve been browsing online more than 3 hours today, yet I never found any fascinating article like yours. It’s beautiful worth enough for me. In my view, if all webmasters and bloggers made just right content material as you did, the web will probably be much more helpful than ever before. “Revolution is not a onetime event.” by Audre Lorde. You actually make it seem so easy together with your presentation but I to find this topic to be really one thing which I feel I would never understand. It seems too complex and extremely large for me. I’m taking a look ahead in your next submit, I will try to get the cling of it! I was examining some of your content on this site and I conceive this internet site is real instructive! Keep on posting. Hey There. I discovered your weblog the usage of msn. This is a really smartly written article. I’ll make sure to bookmark it and return to read more of your useful information. Thanks for the post. I will definitely comeback. Thanks for the good writeup. It in reality was once a leisure account it. Look complicated to more introduced agreeable from you! By the way, how can we keep in touch? Hello, Neat post. There is a problem along with your site in web explorer, would test this… IE nonetheless is the market leader and a big section of people will miss your great writing due to this problem. Great site. A lot of useful info here. I am sending it to several buddies ans additionally sharing in delicious. And of course, thanks to your sweat! Hello there! Quick question that’s entirely off topic. Do you know how to make your site mobile friendly? My weblog looks weird when viewing from my apple iphone. I’m trying to find a theme or plugin that might be able to fix this problem. If you have any suggestions, please share. Thanks! Real great info can be found on blog. “I know of no great men except those who have rendered great service to the human race.” by Francois Marie Arouet Voltaire. This website can be a stroll-through for all the information you needed about this and didn’t know who to ask. Glimpse here, and also you’ll undoubtedly discover it. Very nice design and superb articles, absolutely nothing else we want : D.
I have read several good stuff here. Definitely value bookmarking for revisiting. I wonder how so much effort you place to create any such wonderful informative site. Great post, you have pointed out some great details , I too believe this s a very great website.